I used Jon's Magic Moment Snowflake pattern. I used my daughter's..errr ... I mean Dr. VonThreadmore's HDT size 20, color ..um I forgot! (Hey Kiddo..which color is this one..picture is darker than actual color) I think that means I should label my threads! After I blocked this tatted piece, I went back and looked at Jon's version. I realized that I may have over blocked it. Her center spokes are more curvy and mine are straight. I like hers better! I just finished putting this lil ornament together. I am delighted with the result! This pattern is Sheila Heneise's Angel with Paisley Wings and I created the edging. 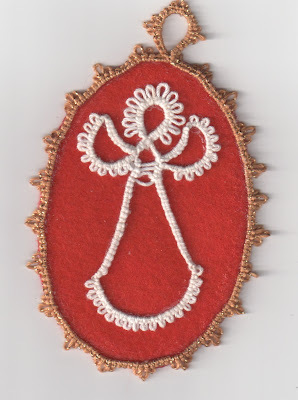 The angel is backed by red felt. 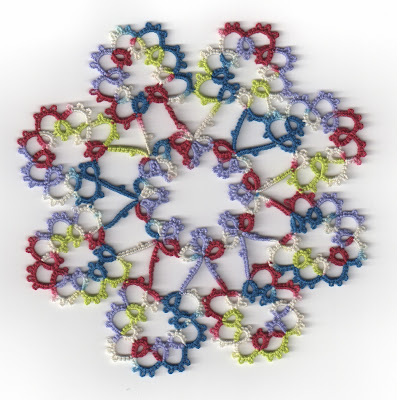 This doily turned out so lovely, the colors did too! 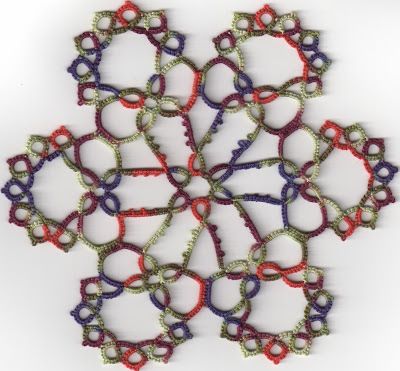 I used the "Arches" doily pattern by Yarnplayer! I used Lizbeth 20, #130 ISLAND BREEZE and #658 Ocean Turquoise Lt. This was fun to do! Thanks Yarnplayer for sharing this beauty! I am glad to have a picture of this for I will miss looking at it. Soon, it will be on it's way to a dear friend in South Korea! Another exciting event! Yesterday I was one out of five lucky recipient of a giveaway! At innocentia's, there was a giveaway for kids clothing patterns from DMK Easywear Patterns. I am pleased to have received the e-patterns of Reversible Tunic Top/Dress pattern! Thank You Citra! Thank You, DMK! 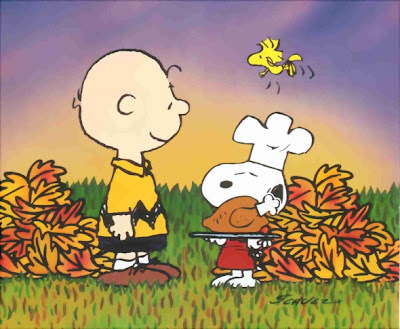 Isn't this sooooo dang adorable? It is sure will be on my two Lil Angels! Right Krystledawne? ... Three Cute Giveaways at Other Bloggers' Blogs! EagleWings is having a giveaway of 4 redwork towels that she had done to celebrate the 100th Follower on her blog! They are so dang cute!!! I love those vintage birdies! For more information to this drawing go to this link! 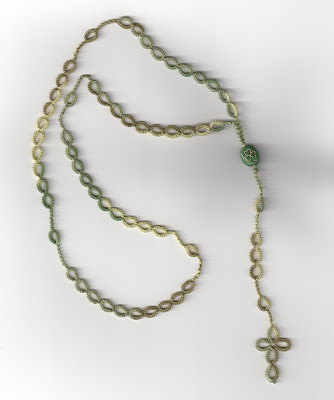 The next giveaway is from Johanna Parker Design , she is in the spirit of the season! Her snowman candy cane stand , the adorable guy made the "Party Picks" section of Phyllis Hoffman's Celebrate Christmas Magazine! You can see his picture and the details for this giveaway at this link. They are such cute things! Good luck! ...Redecorate the Mini Chocolate Box! I honestly thought against doing it.. just because of the timing and the first entrant! So.... I guess I am gonna enter this cute lil box.. but I sure can't out-do Carol's! P.S. the deadline for this is 30th of November.. so if you're interested, go to this link! click here to go to "Who Dunnit" and play along! Good Luck! Evidence : Once was a ball of Lizbeth #128 - MARCH BREEZE thread in size 20. The above picture represents every tatter's nightmare. The last known location of the said thread was located on the end table beside the chair, which is usually occupied either by the Tatter of the house or a four legged child. Many of you know of my recent loss, so I have been busy just to keep my mind from focussing on the loss. I will say it isn't easy because the memories keep flooding in. Then I am warmed by them. I keep thinking of my dear Grandma for how she must be feeling. I went to search for a tatted pattern that would show Grandma how much love that we all have for her too. 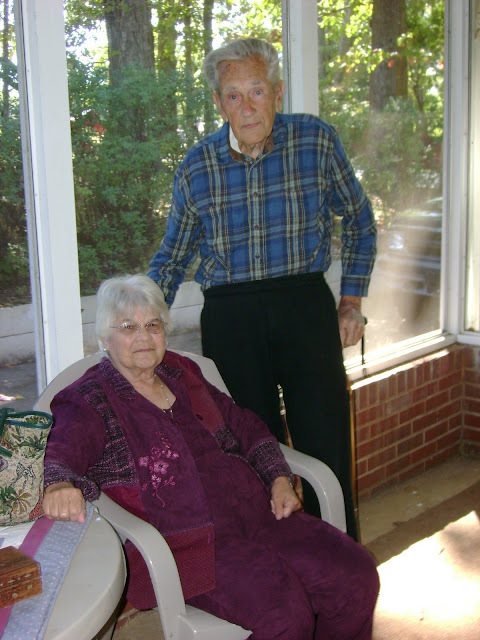 ...come February, I will dedicate a blog entry to my Grandpa. Right now, it is hard... the void is so deep. ...Finally! My Dream Kitchen Curtains Completed! I had began this cute project over a year ago. I bartered with this one Farmgirl at MJF Connection. She had piles and piles of these old hankies that needed a good home. My home! I already had in mind how these lovelies were going to be used. So what does a gal like Karrieann do with some of these? Well, I hand stitched them into a quaint curtain for my Kitchen door. That is what I did! What took so long to get these beauty up? It took me this long to get the needed curtain rod! I live in this small town and only one store carried these rods. At times they didn't have the size that I wanted and I forget to get them at times! Last night these hankies were placed into their place of honor. This is the door that get used more than any other doors and will remind me daily of the generosity of people, people who have kind heart. Thank you Farmgirl "antoinette"! ...This one is my Biggest! YAY!!! I am so so happy with this one. Sadly, this one belongs to a Farmgirl for the barter! I know it is going to a wonderful home. I added one of my tea cup and saucer to the picture to give a better idea to the size of this lovely doily! ...Fresh off the Blocking Board! I was in a need of making a Christmas Themed bookmark for a swap on MaryJanesFarm Connection. 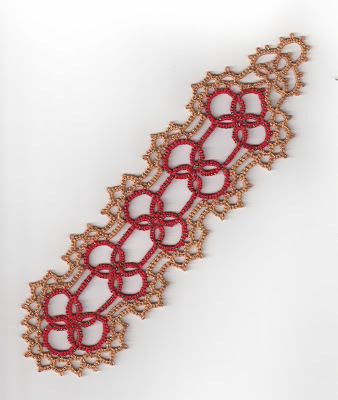 I searched for a lovely pattern online and found it here at Free Tatting Patterns, with the lovely red threads that I received recently... knew that this would be a perfect bookmark for that special Farmgirl! I used J & P Coats Metallic Knit- Cro-Sheen... no idea what size it is! I had fun and this was quick to do... two days for myself. The picture does not show the sparkly metallic in the threads very well.. but it is pretty!